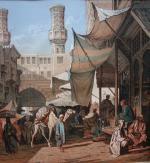 One of 8 antique prints-multiple after watercolours of famous Maltese painter Amadeo Preziosi (1816 Malta -1882 Istanbul/Turkey), who was known for his watercolours and prints from Ottoman Empire, Balkans and Romania. Technique: print-multiple lithograph in colors. Matted. Measurements: image w 11" x h 16 1/8" (28 x 41 cm), with matt w 15 3/4" x h 20 7/8" (40 x 53 cm).